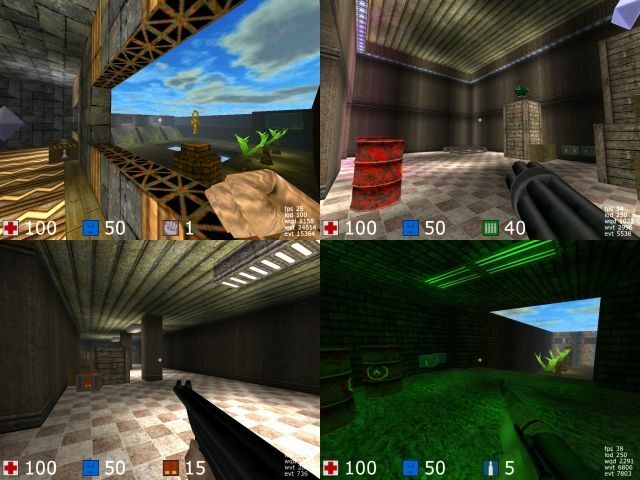 Blurb "Blood Mechanic" is a map that ideally encourages a wide range of playing styles. "Blood Mechanic" is my first foray into Cube mapping as well as mapping for any game. My initial goal was to create a map that had a more Half-Life, as opposed to Quake-like, feel to it. Then I abandoned all pretense halfway through development and decided it was more important to work on how my map was going to guide the action of the game. My hope is that the map encourages a diverse range of playing styles. For example, there is a few places on the map ideal for sniping. However, those places are also open to attack from multiple directions. There also are a couple simple (very simple) jumping puzzles that hopefully reward quick reflexes and dexterity. Getting the quad for instance requires one to look out for enemy fire while focusing on their jumps. To sum it up, I hope you enjoy playing my map and thanks!!! Nice to see the amount of thought that has gone into this. One thing is strange though, no health items? The map can hold quite some players (6 imho) but there´s only two healthboosts, which in the worst case will result in one minute without any chance to get any.. they could be added inbetween the main ammo-distribution corners..
As for the jumps, though nicely done, I don´t think the jump to the green armour would be managed by most players in the heat of the battle (rather hitting the tele)... especially with that usually highly fought over mg-ammo in the place. Seasoned players will manage and probably go for it with a shotgun/rifle jump..
Texturing is a little odd, though, but you´ll soon get more familiar with them. The lightning is good, though a little dark at times. And that magenta light doesn´t fit in there in my opinion. The shotgun corridors look good, simple, yet effective architecture. Thanks for the kind words and insight makkE!! The magenta light is a bit odd. My reasoning at the time was that I wanted players to investigate and use the "green armour room" and I was afraid they weren't (mainly because my first version of the map had a hard to see side entrance where the closed "garage door" is now and no spawn point). Connectivity, there, with the "shotgun corridors" should have been considered in hindsight to promote traffic throughout the map (a broken vent effect would have been nice there I think). I'm not sure what my reasoning was behind lacking health entities but I did want to make health sort of rare I guess in an effort to entice injured campers out of darker corners. But with the more frantic action of Cube (as opposed to the pace of Half-Life DM that I'm used to), I should have considered more perhaps. One thing I got from your comments is that I need to become more aware of the physics in Cube. For example, I really didn't consider that the quad could be obtained with a rocket jump.